MySlavicLady aims to let men meet real ladies from Ukraine. Messaging is free, and the website also offers translation service so that there are no language barriers. Instead of the members having to pay for every message they send and receive, MySlavicLady team decided to eliminate that and make monthly memberships that everyone can afford. Love is not about one's wallet size. 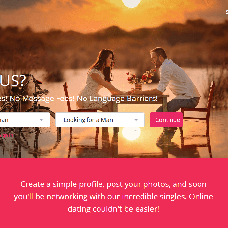 MySlavicLady is possibly the first dating site in Ukraine that does not work with any agency or other 3rd parties. That means that all girls who register go through a strong verification system. It means the lady one can see on the photo is the same they are communicating with.